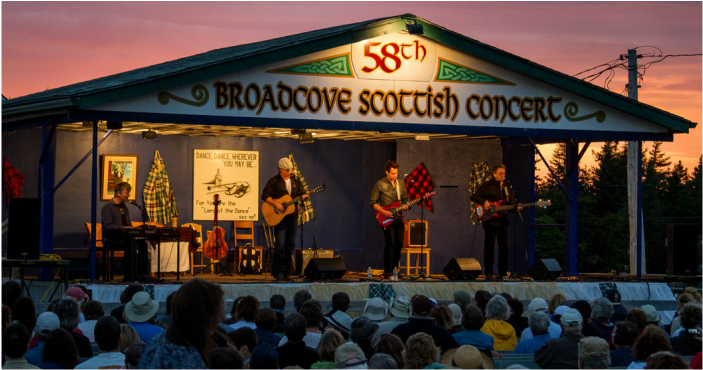 The Broad Cove Scottish Concert, celebrating its 62nd concert, is deemed as the largest outdoor Scottish concert in Cape Breton. The concert holds great significance to the musical culture of our Scottish heritage. The strong dedication of our volunteers has made this concert possible throughout the years. On this, our 62nd anniversary, we salute our volunteers. Entertainment includes traditional piping, fiddling, drumming, dancing and singing. Always held on the last Sunday of July, the concert begins at 3:00 PM. The grounds boast 15 acres of available free parking for up to 2000 cars, full canteen service, merchandising and souvenir booth, fully accessible washrooms and grounds, and a refreshment tent for those who are 19 and above with on site security. The concert is located 3 km north of Inverness on Route 19 on the grounds of St. Margaret of Scotland Parish. Entry Admission $20.00, Children under 12 free. Once across the Causeway and over the swing bridge, you will climb a short hill to a rotary. Look for signs for Route 19 and Inverness (the first left turn in the rotary). You will then be on the Ceilidh Trail (Rte.19) and reach Broad Cove in about 65 minutes. You will pass through the towns of Port Hood, Mabou and Inverness. Once past the town of Inverness, continue driving along route 19. Take a left turn at Broad Cove when you see the sign for St Margaret of Scotland Parish. You will then see signs to guide you to the ticket booth. Parking attendants will assist in guiding you to a parking space on the grounds.